By Adrienne Rivera. Nov 9, 2018. 4:00 PM. Kay Thompson is perhaps today best known for her work on the beloved children's book series Eloise and for her role in the equally famous film adaptation of the musical Funny Face. Both her literary, film, and music careers represent a bygone sort of old Hollywood glamour. From the music she arranged for MGM studios to her night club acts to the ritzy penthouse apartment that served as home to Eloise, Thompson's life and work serve as a glimpse into a exciting age of New York and Tinsel Town that now exists only in pop culture and memories. But it's the human heart of her work and the precocious spirit of Eloise that makes for an enduring classic. Today would have been Kay Thompson's 109th birthday, so let's take a look at the career of this Hollywood and children's literature icon. Kay Thompson was born Catherine Louise Fink in St. Louis Missouri in 1909. In her early 20s she worked as a choral singer for the radio and made her big break at just 24 when she was cast as a regular singer on Bing Crosby Entertains, sponsored by Woodbury Soap Company. The show, instrumental in transforming Crosby from a simple singer to the overall entertainer he as known as today, aired twice weekly and gave Thompson the platform to impress and grow her career. She moved onto other radio shows after the program ended, which eventually allowed her to establish and run her own show in 1935, The Lucky Strike Hit Parade, of course sponsored by Lucky Strike Cigarettes. Thompson's large Rhythm Singer choir began featuring on other radio programs, due largely in part to the strength of her choral arrangements. It was not long after that her success drew the attention of Hollywood movie producers. Thompson made her film debut with her choir in the 1937 musical Manhattan Merry-Go-Round and later partnered with MGM Studios as a vocal arranger for their films, where her star continued to rise. She served as a vocal coach to Judy Garland and Frank Sinatra and oversaw vocals for such films as Zeigfield Follies and The Pirates. She later left MGM in 1947 to tour with her new nightclub act, Kay Thompson and the Williams Brothers, which was an immediate smash hit and is widely considered to be one of the most successful nightclub acts of all time. And during all of this, Thompson made her home at the Plaza Hotel in Manhattan, which is where she conceived of one of literature's most beloved children's book characters: Eloise. 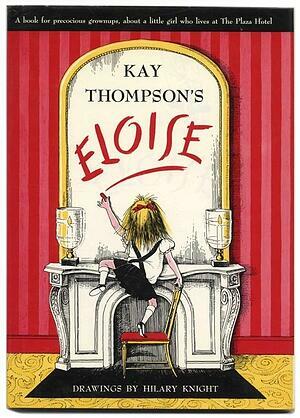 Thompson published Eloise: A Precocious Book for Grown-ups, later retitled just Eloise, in 1955. Illustrated by Hilary Knight, well known at the time for his illustrations of movie posters, in Good Housekeeping magazine, and in the children's magazine Cricket, Eloise was an immediate hit. Children and their parents alike clamored for more. Eloise in Paris followed in 1957, with Eloise at Christmastime and Eloise in Moscow following each subsequent year. Eloise was so well-loved that the Plaza Hotel even hung up a portrait of her for visitors to enjoy. Eloise products were in high demand and Thompson and Knight were stars of the children's book world. There was even a television adaptation on Playhouse 90 in 1956. A fifth sequel, Eloise Takes a Bawth, was slated for 1964, but Thompson abruptly canceled it and pulled all books save the first Eloise from print. Many speculated about why Thompson decided to cancel the sequel to a much-loved and still successful series and prevent other sequels from being printed. Thompson said she had grown tired of Eloise and was done with the series, only wishing the original to be available due to affection for the character. But public opinion on the matter differed quite a bit. Rumor had it that Thompson was jealous of the fame of the character she created and so decided to shut the whole thing down. The flames of that rumor were fanned by Knight's admission that Thompson would no longer take his calls and had canceled the book despite his extensive involvement in its creation and the devastating financial effect pulling the books had on him. In 1996, Knight even illustrated a scathing Vanity Fair cover depicting a dramatic Thompson knocking Eloise off of her stool while scrawling “I am Eloise” in lipstick on the mirror. But even Knight later admitted that he had come to the conclusion that Thompson's issue with Eloise's fame was simply that it had become too much, too fast. Thompson had been, Knight theorized, trying simply to protect Eloise. 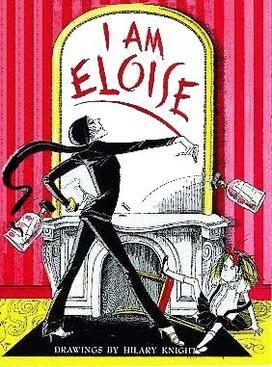 It was not until after Thompson's death that fans were able to see Eloise again in print. The sequels were reprinted and Eloise Takes a Bawth was finally published in 2002. Disney released two well-received adaptations starring Sofia Vassilieva: Eloise at the Plaza and Eloise at Christmastime, which brought the character to a whole new generation of children. Simon & Schuster have also included Eloise in their Read-to-Read line, bringing in writers to create new stories in the style of Thompson and Knight so that Eloise can continue her adventures. Eloise's past continues to enchant and her legacy lives on to inspire. Happy Birthday, Kay Thompson. We can only hope that the ongoing adventures of Eloise are something of which you'd be proud.